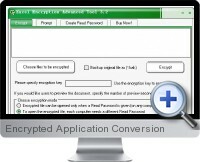 Encrypted Application Conversion for Excel encrypts Excel documents to prevent copying and editing, requiring authorization to read. Encrypted Application Conversion for Excel converts Excel documents into executable application (EXE) files that can only be opened when a password is provided by the creator. When a user wants to open the encrypted application, the encrypted Excel document will pop up a dialog box to request the user to enter a read password. This dialog box displays the machine ID of the user's computer. The user can send their own machine ID to the creator and a password can be created based on the user's machine ID. Since the password is created based on the user's machine ID, the user will not be able to share the password and document with other users. The creator of the application can specify the number of times the document is allowed to be opened, a time limit and expiry date. It can be specified whether free preview is provided. The creator can configure a user prompt so as to let users know how to contact to obtain the a read password. The encrypted Excel document can be integrated with network authentication and member users can be authenticated through the network to obtain a read password.